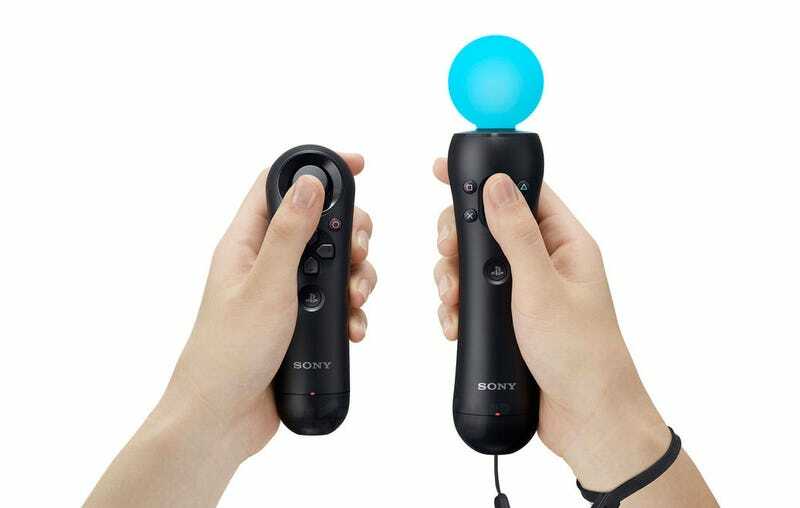 Yesterday, Sony took the wraps off the PlayStation Move, which some people will call Sony's next big thing in video gaming, and others will call a shameless Wii Remote rip-off. Here's everything you need to know about it. We'll be updating this post constantly as we find out more about the Move. The Move is a motion-sensing peripheral, which in conjunction with the PlayStation Eye Camera (which is already on the market) allows precise motion-controlled video gaming on the PlayStation 3. The Move can, in some cases, be paired with the "Subcontroller", a nunchuk-like device that sports an analog stick and d-pad, which allows the Move to be used with more "traditional" titles like first-person shooters or role-playing games. Unlike the Wii Remote, which is powered by regular batteries (or in cases of third-party solutions a rechargeable battery pack), the Move is fuelled by the same lithium ion battery that runs your PlayStation 3's DualShock 3 controller, meaning it'll have plenty of shelf life between recharges. As a bonus, the Subcontroller also has a lithium ion battery. Both the Move and Subcontroller are wireless, and will sync with your PlayStation 3 via Bluetooth (with the Move also featuring rumble). At launch, they will be available in black, and black only. Head over to our gallery for an exhaustive look at both the Move and Subcontroller. It uses a three-axis gyroscope, a three-axis accelerometer, coloured sphere and a terrestrial magnetic field sensor to pin-point the location of the Move, which allows it to easily track any kind of movement the player makes, whether it be slow or fast, small or sweeping. While the decision is not yet final, at this stage, the Subcontroller does not have its own motion sensor. Interestingly, every game we played at GDC required the user to calibrate the Move before playing. It wasn't a big deal, but switching between games quickly it was a bit of a pain. The PS3 will support four individual Move controllers at once, or two sets of Move+Subcontroller. Along with an announcement that some "regular" PlayStation 3 titles will support the Move (such as SOCOM 4, EyePet and LittleBigPlanet), Sony unveiled a range of games built specifically for the new controller's motion-sensing capabilities. In total, Sony says that "more than 20" titles will be released featuring PlayStation Move support by the end of fiscal year 2010.
WHO IS SUPPORTING THE MOVE? HOW IS IT DIFFERENT FROM THE WII REMOTE? While the Move looks similar to Nintendo's pioneering 2006 motion controller, there are key differences, like a reduced button count and what promises to be better motion-sensing. For more on this, read up on Stephen's early impressions of the Move. The Move will be available in three packages: a standalone Move (for consumers that already own a PlayStation Eye camera), a bundle that includes the Move and PlayStation Eye, and a hardware pack that includes the Move, PlayStation Eye and PlayStation 3 console. While pricing details for the standalone pack and PS3 bundle are unavailable at this time, the Move + PlayStation Eye option will cost $99. The PlayStation Move will be released sometime this Fall.